After two-and-a-half months in the city of Poznan, Poland, the time eventually came for me to get back on my bike and pedal out of Schengen Europe. In order to get out of Poland on time (so I didn’t overstay my 90-day limit), I took a train from Poznan to the city of Przemysl in the south-east corner of the country. This is where my “Cycling Eastern Europe” bike tour would truly begin! It was a long, 13-hour train ride to Przemysl, but the train ride was cheap (about $18 USD) and there was hardly anyone else on the train. About half-way through the ride, at around 1 in the morning, a man came into my compartment and asked me for a cigarette. But when I said that I didn’t have any (and that I don’t smoke), he gave me a really strange look – as if so say, “No really! Come on! Give me a cigarette. Just one!” But after a long look into my eyes, I think he could tell that I wasn’t pulling his leg. I didn’t have a cigarette to give him. So he quickly got up and moved on to the next compartment. A few hours later I heard raised voices (in a foreign language – Polish) and quickly realized that two men in the compartment next to mine were fighting with one another. A moment later, both men exploded out into the passageway that runs down the train car. They were pushing each other and throwing blows. One of the men was the man who had asked me for a cigarette just a short time before. And from what I could understand (my Polish is really bad, but I do know a little), the men were fighting because the one man had taken one or multiple cigarettes from another man… and the second man wanted some money for the cigarettes that the first man took. At the next train station, the man who had asked me for cigarettes was forced off the train and he quickly walked away – not quite believing that he had been booted from the train (or maybe, not quite believing that a stranger would get so upset when you take something from them without payment of any kind). Once in Przemysl, I rolled my bike off the train and then walked for a short while around the city. It was only 11 AM at this point, and the hotel where I was planning to stay that night in the city said I could not check into my room until 2 PM, so I wandered up onto the hillside overlooking the town and found a place in the grass to sit and rest. High up on the hill, right near the local ski resort, I laid down in the grass and looked up at the sky as the sun came out and filled me with warmth for the first time in several months. It had been a cold, dark winter in Poland. I hoped that the sun was a sign of good weather to come over the next several weeks. I could have easily crossed over into Ukraine that first day, but it was getting pretty late by the time I reached the border area, and I could tell by looking at the map that it might be difficult to find a place to stay or camp as soon as I crossed over into Ukraine. So when I saw a remote forest road near the border in Poland, I traveled down it a ways and pitched my tent in the forest. It was a dark, cold night (seriously, freezing cold! ), but I survived by wearing every piece of clothing that I currently posses. And I entertained myself by listening to podcasts and reading ebooks on my smartphone. I was a little cold at times, but overall, I enjoyed myself. The following day, I packed up my campsite, rolled my bike back out to the road, and then cycled a short distance (probably less than 10 km) to the Poland/Ukraine border near the town of Kroscienko. It was here that I encountered my first issue with cycling in Ukraine. As I pulled up to the border, I could see that there were a bunch of locals standing on the side of the road, trying to flag down passing vehicles. They weren’t young people, so I knew they weren’t prostitutes (something I have seen in many other countries all around the world), but I wasn’t sure exactly what was going on. When I rolled up to the border, however, I quickly discovered that Ukraine (or this particular border crossing – I’m not sure which) was not allowing pedestrians or cyclists to cross through the border. You had to be in a car or truck… or riding a motorcycle. That being said, I gave the border guards my passport and stood with my bicycle – waiting. A few minutes later, they handed my passport back to me and said that I could go through the border on my bike, but that I needed to follow the automobile in front of me and go through the border with them. So that’s exactly what I did. I teamed up with the stranger in front of me (an old Ukrainian man driving a beat up Honda Civic-style sedan), and after our paperwork was checked (together), we both drove through the border into Ukraine. Little did I know, I’d have this exact same problem when trying to exit the country a week later – but the people on the other side weren’t going to be quite as accommodating. 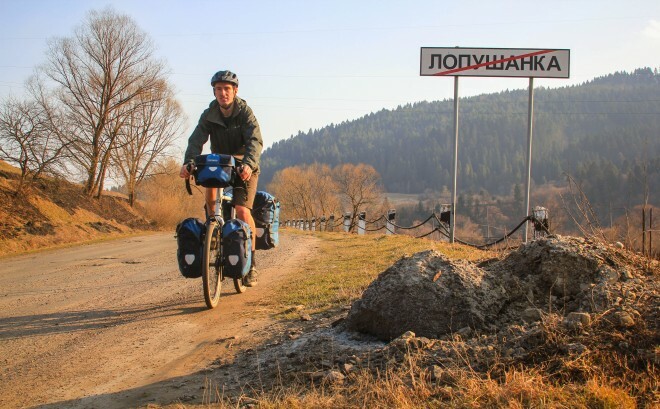 Entering Ukraine was an interesting experience – not because anything necessarily interesting happened to me, but because I’ve cycled across Ukraine before (during the winter of 2012). During my first bicycle tour across Ukraine, I entered the country on a sunny day, but when I woke the following morning, I was surrounded by a thick, dark and freezing cold fog that did not go away for the entire 1-month that I was in the country. The fog was so thick that I could barely see just a few meters up the road, and the moisture in the air hung to everything it touched – my clothing, my tent, my panniers, etc. This time around, I entered Ukraine on another clear and sunny day. Like before, however, the air was cold and I know that winter conditions could be encountered at any time. With my jacket on, but my rain pants packed away, I cycled east to the city of Khyriv and then south to Staryi Sambir. Once in Staryi Sambir, I set out to find a bank or ATM machine and withdraw some Ukrainian money. A tall, beautiful woman standing on the side of the road wearing a dark black trench-coat pointed me in the right direction. Even though my map said that there were three ATM machines in town, I could find only one. The first ATM machine was missing completely. The second one was there, but was no longer in operation. And the third one, when I finally approached it, would only let me withdraw a small amount of money (no more than 1000 Ukrainian hryvnia – about $45 USD). When the man behind me in line at the ATM tried to withdraw money, he was refused. So he went in and asked the bank manager what was wrong. The manager shrugged his shoulders and said, “We’re all out!” (Or at least, I assume that’s what he said, because I don’t speak Ukrainian). And everyone else in line behind me suddenly turned on their heels and walked away. I had less than $50 USD to my name…. and I hoped it would be enough to get me to the next major city along my route. Little did I know at this point in time just how inexpensive things in Ukraine currently are. After leaving Staryi Sambir, I began cycling up a long, steady incline. It was so long and spread out that there were times when I had no idea I was going uphill. It was only when I stopped and look back at where I had come from that I could tell I was indeed climbing a sizable mountain. After a full day of cycling through run-down Ukrainian villages, I was amazed to see a modern, camping-style accommodation at the top of the hill. The gate out front was locked and there were no cars or people in sight (I was traveling through the area well out of the summer and winter tourist seasons), but I thought there might be someone inside. So I climbed under a hole in the fence and walked inside the large cafeteria on the properly. Inside, I could see a woman on the far end of the building, talking to someone on the phone. I approached the woman in the dark and tried to get her attention – not wanting to frighten her. But when she saw me, she didn’t pay me the least bit of attention. In fact, she tried to wave me away, saying something like, “Go away! There’s no food here.” But I wasn’t after food. I wanted a warm place to sleep for the night. I laid my hands up against the side of my head and closed my eyes, as if I were taking a nap… and the woman instantly understood. “Oh! I’m sorry,” she mouthed to me in Ukrainian. “Yes, we do have a place for you to sleep tonight. Hold on one minute!” (I’ve become quite good at reading people’s minds – despite the fact that we don’t speak a common language). The old woman fetched her husband who spoke a little German (which I do know a little of) and I explained that I wanted a place to sleep for the night. He said it would be 150 UAH (about $7.00 USD) and I happily accepted. After locking my bicycle in a shed near a locked up hound, the man had his son walk me to my room (pictured below). The place was far from the fanciest accommodation I’ve ever stayed in… and there was no warm water to speak of (just freezing cold snow water), but it was cheap and relatively warm – especially after they fired up the electrical floor heater. For only seven dollars, I really couldn’t complain. It was a freezing cold night out… and I was happy to be indoors. Happy to be back in Ukraine! The next morning I packed up my bike and hit the road once again, preparing for another long day on the bicycle. Little did I know at the time, I’d be spending almost the entire day riding up a sizable mountain pass. It was cold and windy and I struggled with regulating my temperature – trying to stay warm and comfortable, but not so warm that I started to sweat. The roads were rough and the potholes were massive. But the scenery was spectacular and there were hardly any cars on the road. The few cars that did come up from behind me could be heard coming from a good half-kilometer away. The potholes in the road are a good alarm system… and they slow down the vehicle traffic tremendously. As I approached the top of the pass, snow started to dot the ground. Decrepit wooden homes were scattered across the landscape and the terrain became more and more remote (the kind of stuff that I like best). I took my time and stopped on several occasions to take photos and simply take in the scenery. There was hardly a soul in sight… and those that did pass me on the road were friendly and polite. I knew I was nearing the top of the pass when I saw a ski lift running up the side of the mountain and then passed a large sign welcoming Ukrainian visitors to the ski resort in the area. Then, somewhere right near the top of the mountain, I saw a barricade going across the middle of the road and I thought, “Oh no! They’ve closed the road due to snow and I’m not going to be able to get through this way.” I took a photo of the barricade and then moments later was approached by two Ukrainian soldiers in full camouflage – each carrying at least 1 or 2 large guns. It was then that I realized the barricade wasn’t there for the snow. It was a military checkpoint! To make a long story short, the soldiers checked my passport and then asked that I delete the photo I had taken of their barricade at the top of the mountain. I was fine with that. I deleted the photo… and then they waved me on my way. I had reached the top of the mountain… and I was sure it was going to be all downhill from there. Boy, was I right! After a long, beautiful, sunset ride down the southern-facing side of the mountain, I slammed on my brakes while entering the tiny village of Uzhok. There, at the northern-most part of the city, was a large, modern-looking tourist recreation center, with log-cabin style villas, a restaurant, office, ATV rentals, a picnic area and a whole lot more. After loading up on food and drink at the small shop across the street, I went inside the rec center to inquire about a room for the night. For less than $11 USD, I was given THE MOST beautiful accommodation of my entire bike tour! Not only was my log-cab-style room clean, warm and beautiful, but there was even wireless Internet – way out here in the middle of nowhere in the mountains of Ukraine. After showering and dressing in my warmest off-the bike clothes, I went for a short walk around the village and then returned to the rec center just in time for dinner. There was a small, circular building on the property that I knew was a restaurant, but it seemed as though I was the only tourist in the rec center, so I wasn’t sure if, after entering the restaurant, anyone would be in there. I was a little frightened to enter actually, because it was dark inside and the windows were blacked out from the exterior. It was like entering a dark cave. On the inside, however, I was delighted to see a warm, cheery room, decorated with green plastic vines hanging from the ceiling and the circular pillars that ran around the center of the building. At several tables lining the wall were two or three groups of people eating dinner and/or enjoying their drinks. I approached the bar and asked the young, blonde woman behind who was obviously the only worker in the place if I could see the menu. She told me to take a seat and she brought the menu over to me. It was entirely in Ukrainian and I couldn’t read a thing, so I asked the woman if she had anything that was vegetarian. She didn’t speak English, but I could tell she understood me. A few minutes later, she brought me a small bowl of mushroom soup and a large salad consisting of nothing more than beets, carrots and burnt brown beans. The salad was my favorite! And the best part was, the entire meal cost me only $2.25 USD. The following day was my favorite day in Ukraine… and it was my favorite because it was almost entirely downhill… through some of the most beautiful scenery in the country. I had planned on only cycling about 40-50 kilometers that day, because the day before had been so difficult. But because I was flying downhill, I was able to easily cover the 90+ miles to the city of Uzhhorod – my first major city in Ukraine. I was excited to see what Uzhhorod was all about. After having spent the last few days traveling through the remove villages of south-eastern Poland and western Ukraine, I was looking forward to being in a major city where there would be more food choices. It took me a while to find a place to sleep for the night though. The first two hotels I tried were all booked up, the third hotel was way too expensive, and it wasn’t until I had cycled all the way around the city that I finally found a hotel right near the center – for only $10 USD per night. I love bicycle touring in parts of the world where I can actually afford to sleep indoors at night. Rather than rush off down the road, I decided to stay in Uzhhorod, Ukraine for one more night. I spent the day walking around the city, taking photos, shooting video, watching the people and simply exploring. That night, I ate pizza at a local restaurant. The place was filled with families and friends and young people on dates… and I sat at a table in the corner all by myself. Not my definition of fun! And the pizza wasn’t very good either. I don’t enjoy eating out… and I really don’t like to do it when I’m traveling alone. That night my hotel moved me into another room. This room cost me $13 per night and was supposedly the fanciest room in the entire place. It had a big balcony overlooking the hotel courtyard, but I was unable to get the hot water to work, so I went that night without a shower. Looking back on it now, I should have stayed in Uzhhorod at least one or two more nights. I was in no rush to continue down the road. In fact, I was already way ahead of schedule. But I did pack up and leave the city after only two nights there… and that’s when I suddenly switched from taking lots of photos… to shooting lots of video. The video above is far from polished, but it gives you a taste of what I did that day during my bike ride from Ukhhorod to Berehove, Ukraine. I posted this short (and truly incomplete) little video to Bicycle Touring Pro’s YouTube channel, thinking I’d get a lot of negative comments about it, but I was surprised to see that people really enjoyed the slice-of-life look at my life on the road. In fact, people were asking for more videos like this… so I decided right then and there that I would start shooting more video… and that’s exactly what I did. Leaving Berehove, Ukraine, I started shooting tons of little video clips on my smartphone. Not focusing too much on production quality, I began to try and simply tell the story of my day on the bike through my smartphone’s video recorder. The video below is truly the first full episode of my new bicycle touring vlog series. 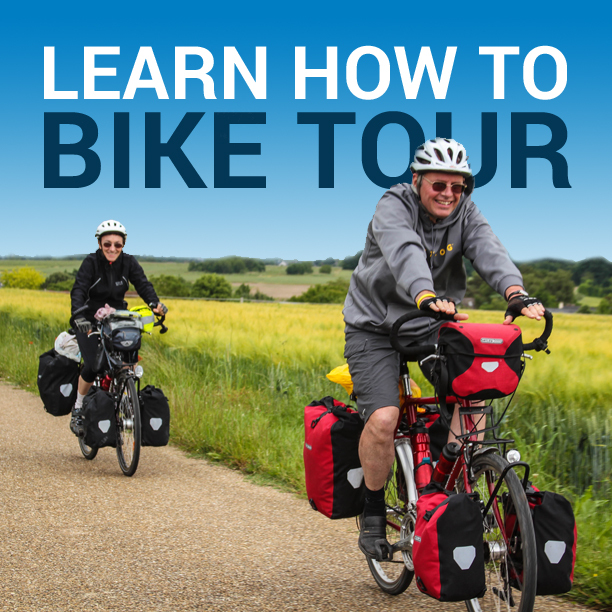 Watch it… and I think you’ll have a pretty good sense of what it’s like to go bicycle touring (not only in Ukraine, but anywhere in the world). Cycling out of Ukraine was an issue, because once I reached the border the guards there refused to let me through on my bicycle. They insisted that even though the border was a flat, perfectly paved road that was no more than 100 meters long, I had to catch a ride from a passing vehicle. I could not simply cycle across the border. So I stood at the border for more than two hours, trying to catch a ride with every passing vehicle. But this was a remote border crossing with few cars or trucks passing through. Those vehicles that did arrive at the border were either too small to carry both me and my full-loaded touring bicycle, or they were already so full of stuff that they did no have room for me. There were a few vans that passed through the border that did have room for me, but for whatever reason, the drivers didn’t want to help me out. So I stood with my bike at the border for a very long time, just waiting for a kind individual to come along and give me a ride. Luckily, I did eventually get a ride through the border with a man named Dan, who told me he was a border guard himself. After taking my bicycle apart and loading it into the back of Dan’s car, we had our passports checked and were, just a few minutes later, in Romania. When I asked the Ukrainian border officials why I couldn’t go through the border on my bicycle, they said it was because the Romanian border officials wouldn’t allow it. But when I got to the Romanian border, I asked the border officials there why I had not been allowed to ride through the border on my bicycle, and they said it was because the Ukrainian border officials would not allow it. Sounds to me like neither of these people know why this rule is in place. It’s just a stupid rule that someone came up with… and both sides are following the rule, despite not knowing why it’s a rule in the first place. Instead of dropping me right on the other side of the border, Dan drove me about 50 kilometers away to the city of Carei, Romania – which is where he lives. He dumped me out in a grocery store parking lot and then I was forced to put my bicycle back together and find a place to sleep for the night. The following day, I packed up my things and began cycling south through the flatlands of northern Romania. After a good, long day on the bike, I pushed my bike uphill into a nearby mountain forest and spent the evening camping in my tent. It was warm enough to sleep outside that night, and I actually had to remove some of my clothes because I was getting too hot. But the good weather didn’t last. It got pretty cold after that, and for the rest of my bike ride across Romania I was wearing either one or both of my two jackets. Rain and snow were in my future! It took me a few days to get back on track after Dan (the Ukrainian border guard) had dropped me off in Carei, Romania, but I eventually got back on the route I had planned to take across the country. When I reached the city of Targu Mures, I felt a little bit at home, because this is a city that I have been to before. After finding a pension on the outskirts of the city, I met up with a young Bicycle Touring Pro reader named Gergo who lives in Targu Mures. We met at a nearby gas station and then cycled across the city to a restaurant where we enjoyed a pizza together. We spoke about possibly doing some cycling together later this summer… so you’ll have to stay tuned to see if we are able to make that happen. The bike ride from Targu Mures to the nearby city of Sighisoara, Romania was a short one (only about 55 km), but there was a good-sized hill or two along the way. I was more than a week ahead of schedule at this point and my final destination of Brasov, Romania was really only a two-day bike ride away. So, rather than rushing straight to Brasov, I decided to spend an entire week in Sighisoara. I’m glad I did too, because Sighisoara is a beautiful little town with lots of good hiking trails in the nearby forests… and s few good restaurants scattered about the city as well. During my rest days in Sighisoara I did a lot of computer work, I went hiking, biking, and even found a few local geocaches. Have you ever gone geocaching? When my time in Sighisoara finally came to an end, I was a little sad to leave. When you spend so much time in a place, you get a little attached to it and it’s difficult to say goodbye, knowing you might not ever get back. But I did eventually pack up my things and cycle out of the city – through the mountains and south to the city of Fagaras, Romania. It was super cold and snowing during my bike ride through the hills, but it was a good, scenic bike ride, and I was able to find another warm and affordable place to spend the night. The next day, I had one of the best bicycle touring experiences I have had in recent years. The ride from Fagaras to the nearby city of Rasnov, Romania was a short one (about 50+ kilometers), but there was a large mountain pass I would need to cross over… and the pass was covered in snow! Watch the video below and you’ll see what I had to do in order to reach the city of Rasnov. It was cold and hilly, but it was seriously my favorite day of the entire bike tour! Still ahead of schedule, I spent two nights in Rasnov, Romania. During my rest day in the city I went on a long hike in the mountains and encountered dinosaurs (yes, dinosaurs!). I also snuck in and explored the Rasnov Fortress which sits on the mountain top high above the city center. Then I cycled a super short 10 kilometers up a steep, snow-covered mountain road to the nearby resort town of Pioana, Romania – which is where I would spent my last night before cycling down the mountain the following day and checking into my AirBNB.com apartment in the center of Brasov, Romania. And that’s what I did. After more than 22 days of non-stop travel, I coasted down the mountain to the center of Brasov, Romania (a city I spent a month living in during my 2012 bike tour across Europe), and I checked into my new apartment. I’ll be spending the next two months living in Brasov before packing up my bike once again and cycle west toward Serbia and Bosnia and then spending the rest of the summer cycling in the Scandinavian countries of Denmark, Norway and Sweden. So watch the video below to see what it looks like here in beautiful Brasov, Romania…. and then stay tuned for more bicycle touring adventures in the very near future! Please let me know if you like these little daily bike touring vlog videos. If you like them, I’ll make more of them. And the more I make, the better they’ll get. So you’re comments here are greatly appreciated! This entry was posted in Bicycle Touring Pro Articles, Darren Alff's Bike Tour Blog, Europe, Featured Articles, Locations, Main Articles, Photos, Poland, Romania, Ukraine, Videos and tagged bicycle touring in Ukraine, bicycle touring pro vlogs, cycling eastern europe, eastern europe bike tour, eastern europe destinations, poland bike tour, romania bicycle touring, romania bike tour, trouble at ukraine border, ukraine and romania bike tour, ukraine bike tour, ukraine border crossing with a bicycle. Darren, I read your article with extreme interest. Thanks for sharing your thoughts and your route – it will be very useful for me. I’m planning to do a very similar route starting in November 2015. When exactly did you cycle? I did this bike tour between mid-March and mid-April, 2015.
instructor and tandem pilot, also a cyclist and my concern is that you have appropriate helivac and repatriation insurance that clearly covers you for paragliding training abroad and not just for “excursion paragliding rides” and obviously I wish you to know that this is very important for your own well being, the cost of privately paid repatriation will likely run into hundreds of thousands of dollars, I kid you not. I know that you have had previous experience with paragliding, (I have been following you for a long time now)and under benign conditions paragliding is a relatively safe sport, however it is actually an extreme sport and if things go wrong, they generally go spectacularly wrong with disastrous results. I don’t mean to be negative just cautious. I appreciate that you may think it’s all good and not to worry but really I’ve seen many accidents that shouldn’t have happened because of that kind of reasoning. I’m following your videos and they’re great! Cycling is very nice, travelling and making friends too. Your videos have also inspired me, along other videos, to plan my first bike tour within some months. Thanks! You’re right. I love the off-road riding in Romania. I’ve done some of that in the past… and I loved it. I even did some motorcycle riding in Romania this past year. It was a blast! I want to come back to Romania with my mountain bike sometime so I can do some serious off-road riding. That’s so awesome. I love that part of the world. Be safe… and have a great time. Your route across Ukraine from Poland to Romania is similar to the cycling-tour I made exactly two years before you. It’s a beautiful part of Eastern Europe and I may well do it again some day. I knew to head straight from Uzhgorod to the border crossing at Sighetu Marmatiei, however, because I had hitchhiked through the Halmeu border crossing before and knew that you could only cross in a motor vehicle there. Whether one can walk/cycle across a border crossing connecting an EU country and a non-EU country often depends on whether there are two towns on either side and historically people have always gone back and forth for work and family life. At the border crossing with Sighetu Marmatiei on the Romanian side and Solotvyno on the Ukrainian side, that is the case, but at the Halmeu border crossing there hasn’t been that big daily flow and so rules are kept tight for security sake. So, any cyclist would do better to head for Sighetu Marmatiei, where you can ride your bike over the little one-lane bridge connecting the two countries across the river Tisza, and the Casa Veche hotel in Sighetu offers some wonderful eating and sleeping opportunities for a hungry and weary cyclist.